A new 100th anniversary edition of the only adult book on one of the odder disasters in US history—and the greed, disregard for poor immigrants, and lack of safety standards that led to it. Around noon on January 15, 1919, a group of firefighters were playing cards in Boston’s North End when they heard a tremendous crash. It was like roaring surf, one of them said later. Like a runaway two-horse team smashing through a fence, said another. 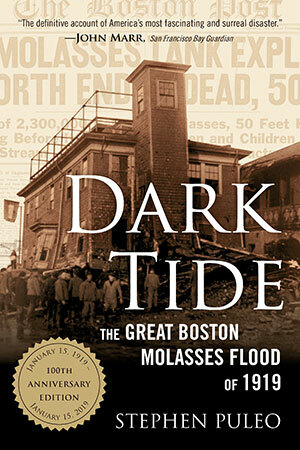 A third firefighter jumped up from his chair to look out a window—“Oh my God!” he shouted to the other men, “Run!” A 50-foot-tall steel tank filled with 2.3 million gallons of molasses had just collapsed on Boston’s waterfront, disgorging its contents as a 15-foot-high wave of molasses that at its outset traveled at 35 miles an hour. It demolished wooden homes, even the brick fire station. The number of dead wasn’t known for days. It would be years before a landmark court battle determined who was responsible for the disaster. 6. Before . . .